Whether you’re a serious cigar collector or a professional that requires some sort of display storage, cigar cabinets are a regal storage solution. These large behemoths can store anything from 1,000 cigars upwards and are usually made from wood. There are many options on the market and it can sometimes be difficult to buy the right one given that it’s such a large object as well as an investment. This guide provides an outline of their benefits as well as their drawbacks while providing our recommendations of the best cigar cabinets to buy online. Why Buy A Cigar Cabinet? You can use the links above to jump ahead. Alternatively, head to the menu below to learn more of what we cover in this guide. What Are The Best Cigar Cabinets? A cigar cabinet is the ultimate storage solution for truly serious and passionate cigar collectors and professionals. An imposing cabinet makes a statement and acts as a centrepiece to your home. If you own or are planning to own a large collection, a cigar cabinet may be the ideal choice for storing your cigars. After all, a proud cabinet in your house will be the ultimate expression of your passion. However, if you have a modest or moderate collection, it may not necessarily be the type of storage best adapted to your needs. For instance, a humidor needs to be at least a third full to really be effective. If you have a much smaller collection, consider checking out desktop humidors instead. One of the greatest benefits of a cigar cabinet is that it showcases your collection with large and imposing storage. As they’re usually fitted with glass displays, you and others will be able to admire your precious sticks. Similarly, you’ll be able to store all your cigars in one place. While there are some clear advantages to storing cigars in different containers, you may prefer to consolidate your collection. Furthermore, some argue that cabinets are probably among the best for long-term storage and many are designed with ageing in mind. Given that they’re often made or lined with Spanish cedar, they create a pleasant environment for your cigars. As such, most have partitions where you’ll be able to place entire boxes rather than having to empty them like a typical humidor. Unfortunately, cigar cabinets aren’t perfect and they do come with their own setbacks. Firstly, they’re notoriously difficult to manage. Being a very large storage space, it can often be challenging to maintain a stable humidity and suitable environment for your cigars. Being so large, it can be difficult to use typical humidification devices alone and you’ll also have to depend on electronic devices. Not only is this an added running cost but it also means that your cabinet is power-dependant. If there were to be a power cut, you may experience humidity issues quite quickly. This can link to another issue where you’ll effectively be placing all your proverbial eggs in one basket. If you run into any humidity or power issues, it may well effect your entire collection. Meanwhile, storing them in different containers will require a little more work but you may run fewer risks. Like wooden humidors, cabinets require regular maintenance and preparation for their first use. The seasoning process is very similar but on a much larger and more intense scale. Needless to say, cabinets are very large. While that’s largely the point of owning one, sometimes their size and be cumbersome and something of a burden. Not all homes will have enough space for keeping one and they can be bulking if you need to move them. Finally, not all cigar cabinets are made equally. Despite their high price tag,some can be made from low-quality materials. Cabinets also often feature glass fronts. As such, you may experience moisture exchange and leakage with the outside environment. Cabinets aren’t the easiest type of and they’re something of a commitment. However, if you’re ready to make the next step into collecting, we’ve outlined some basic advice to help you find the right one. At such a budget, you should expect that the entire cabinet is properly lined with Spanish cedar as well as featuring shelving from the same wood. No other types of cedar are worthwhile substitutes as Spanish cedar offers unique properties for cigar storage. Even a cheap cabinet is a heavy investment. Therefore, make sure that you’re investing in a reliable brand that offers all the features that you require. If you can, inspect or enquire about how the glass is sealed into the cabinet. Poor seals on glass fronts is one of the leading causes for moisture exchange. Cabinets come rarely equipped with their own devices. Therefore, you’ll also have to include this in your budget. Larger cabinets will require a form of air circulation device to ensure that the moisture is properly distributed. However, you’ll also need humidifiers. With regards to electronic devices, Oasis tend to manufacture reasonable quality that will set you back around $100 on Amazon. 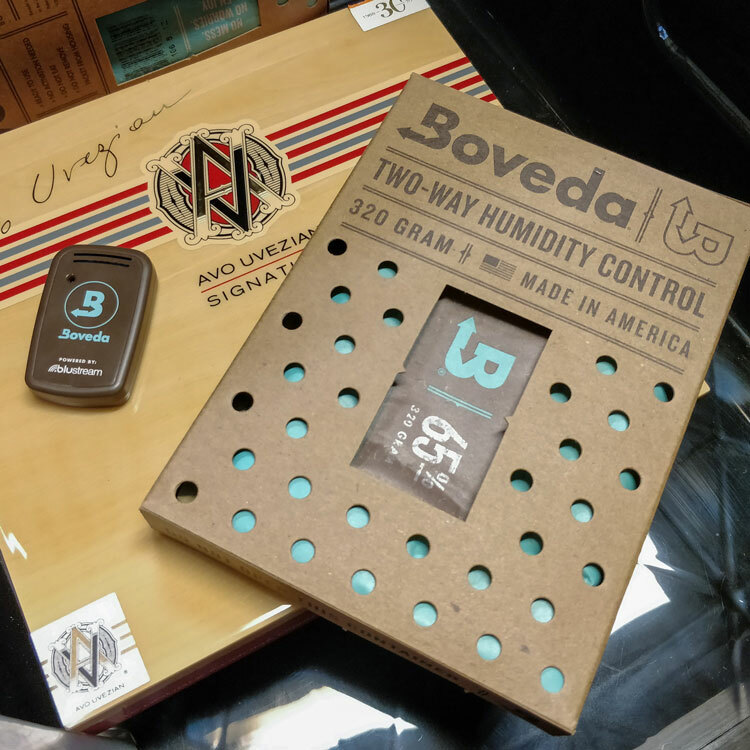 With that being said, we place a lot of faith in Boveda’s 320g humidity packs, provide enough moisture for a cubic foot of storage. However, a typical cabinet offers about 10 cubic feet of storage so you’ll have to purchase at least 10 packs. Nevertheless, we believe that they’re far more reliable than electronic humidifiers so you’ll have to find the right balance between the two. Finally, most cabinets don’t come with hygrometers. In order to be able to properly check the humidity levels inside a large cabinet, you’ll need several that are evenly spaced out. Given that the humidity may not be consistent within the entire cabinet, this is a necessity. Furthermore, ensure that your hygrometers are reliable, digital models and not analogue. Don’t forget to calibrate them too! Otherwise, you may be working off inaccurate readings! Finally, don’t grab the smallest cabinet just because it’s affordable. Likewise, don’t plunge for the largest just because size matters. Instead, choose a configuration that best suits your planned collection and your needs. A cabinet that’s too small may result in packed cigars that will prevent proper moisture circulation. This can lead to humid and dry pockets in certain areas. Meanwhile, one that’s too large may struggle to be properly humidified. Your cabinet size should be like choosing a fridge – pick one that’s the right size for your family’s needs! As previously mentioned, cabinets require a lot of preparation and supervision to ensure that they function properly. We briefly touched on this earlier. Like a wooden humidor, you’ll need to season a cigar cabinet. While the same logic applies, this will be undertaken on a much larger scale. Seasoning is important because the cedar lining of a new cabinet will be bone dry. If you throw your humidifiers and cigars in there straight away, you’ll find that you’ll struggle to get a reasonable humidity level. This is because the dry wood will be absorbing the air’s humidity. However, it may also be sucking the moisture from your cigars! In our seasoning guide, you’ll learn that there are several ways to do this. We would advise against the wipe-down method on cabinets as it may warp the wood. Meanwhile, the bowl of water method may take weeks with some large quantities of distilled water. Instead, we would recommend that you use the large 320g Boveda seasoning packs for every cubic foot of storage over a period of two weeks. Head to our wooden humidor seasoning guide to learn more. Depending on your humidifier, you may need to check on your cabinet every day. Some electronic humidifiers require recharging every 24 to 48 hours and should not be left to run dry. 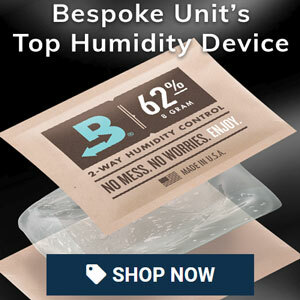 Not only will this cause humidity drops in your cabinet but it may damage the device. Even if all is running correctly, you’ve effectively left all your eggs in one basket. Therefore, be sure to checking on the humidity level on a daily basis so you can intervene if there are any issues. Our favourite cigar cabinet is a subtly-designed piece of ornate furniture. This practical cabinet can be discreetly placed in a room as decoration without giving its purpose away. Nevertheless, we like the idea of using it to place a desktop humidor on top with a smaller collection. The Montegue is equipped with two interior A/C outlets for electronically-assisted humidification and ventilation as well as two locks for safe keeping. A classy cigar tower with an ornamental finish, this is the most decorative cabinet featured in this list. It features a Spanish cedar lining with 4 adjustable shelves as well as 8 drawers and 4 removable trays. As with the above end table, there are two A/C outlets for powering your humidification devices. You also have a lock and key to keep your cigars safe from nimble fingers. A conveniently stackable miniature cabinet, the Mini Tower can be used as free-standing storage or like a desktop humidor. Unlike the other cabinets, it’s not equipped with a A/V power source. However, given its smaller size, we’d probably equip it like a typical humidor. Speaking of which, it comes with an analogue hygrometer. Be sure to calibrate the hygrometer if you want to use it but don’t rely on its readings. We’d add a digital humidor for a second opinion! With the exception of the Reagan below, the Remington is the only cigar cabinet with an in-built humidification system. It’s also equipped with temperature control so offers a comprehensive cigar storage solution. This behemoth is the Remington’s older brother with a whopping 4,000 cigar storage capacity. It’s effectively made using the same construction, which features a cherry wood finish and heavy duty-sealed tempered glass front. You benefit from the same in-built humidity and temperature control as the Remington but with a twin-readout given that the cabinet is separated down the middle. This allows you to create two separate environments should you want to separate your collection. An alternative storage solution, this secrétaire is designed for laying out your singles for ageing. Each drawer features its own partitions that can hold any cigar vitola up to 8×55. While this isn’t the best use of space, some people may appreciate the organisation it offers as well as the ability to carefully age your individual cigars. Below is a larger humidor for boxes and there’s an A/C power outlet for your devices.